I did it! My first attempt at Alabama Chanin style reverse applique is done and I love it!! Texture Clothing’s amazing knits were perfect for this project. You can enter to win some for yourself – there’s a giveaway at the end of this post! 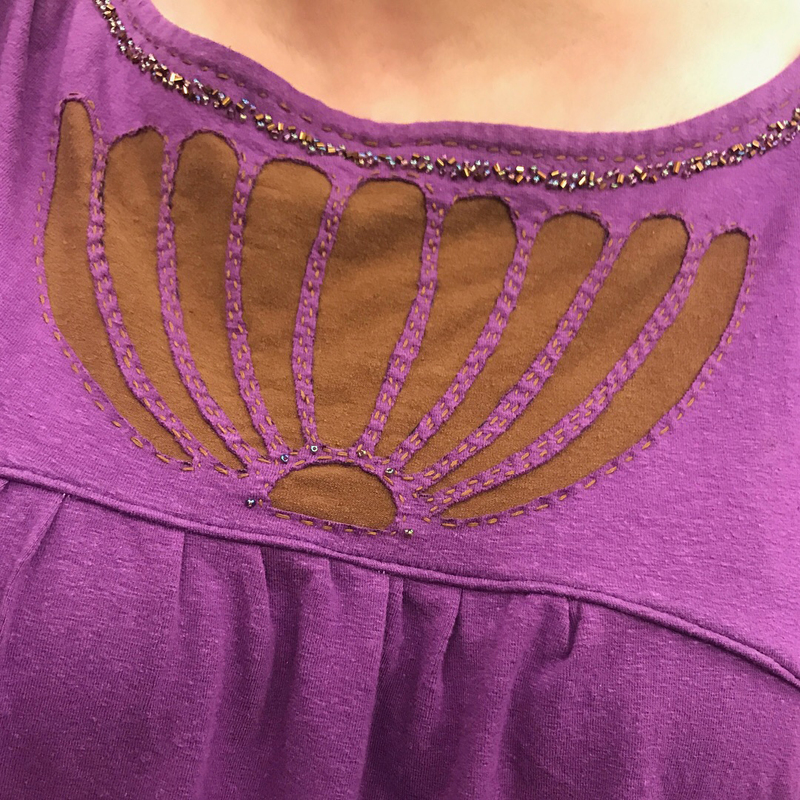 When I first got a copy of Indygo Junction’s Slight Sleeve Top, I immediately saw the yoke as just begging for embellishment. It would be lovely in a contrast fabric or all one fabric, too. But, I wanted to play! I’d been talking with Teresa, owner and designer of Texture Clothing about a joint project. My Sewing Workshop Ivy Tunic (above) is made from some of Teresa’s fabulous cotton and hemp knit and it got a lot of attention. So, she proposed sending me some fabric for another blog post as a thank you. And, I’m not dumb . . . at least not about fabric . . . so I quickly said YES! 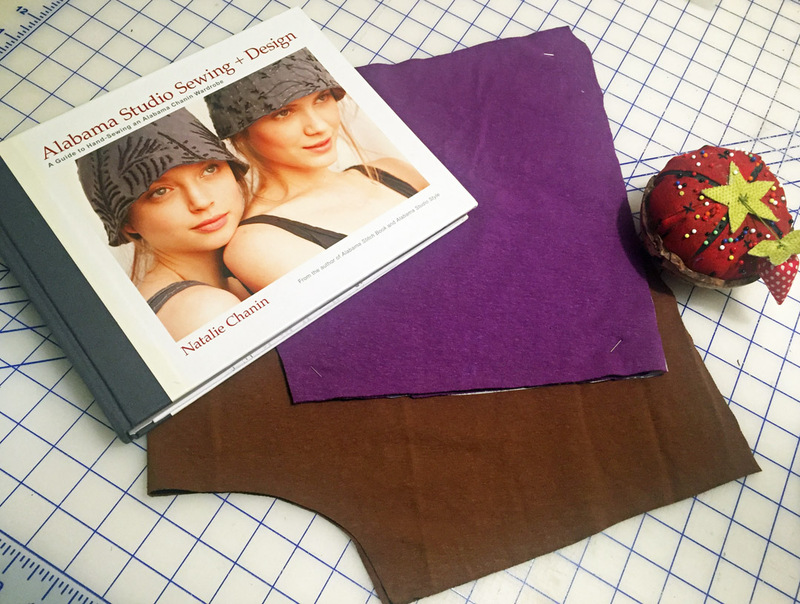 After choosing and receiving two solid knits from Teresa’s stock, I began to plan the Alabama Chanin style applique I wanted to try. The Texture Clothing fabric is the perfect weight for this style of applique! You really should take a look at some of Natalie Chanin’s wonderful books, If you can’t find them locally, click here. Here’s the basic process in six steps. Choose a stencil design for your applique. I used one from the Amy Butler stencil book I’ve owned for years, but there are lots of choices out there. Using fabric paint (Jacquard is great), stencil the design onto your chosen area. Let the paint dry, then back the painted area with a second layer of knit fabric. Pin the layers together so that they will stay in place while you are stitching. Stitch around the stenciled design a fraction of an inch away from the edge. Trim away the painted design, leaving a narrow border inside the stitching. Use caution so you do not cut the backing fabric. Add beads or just leave your stitching as is. 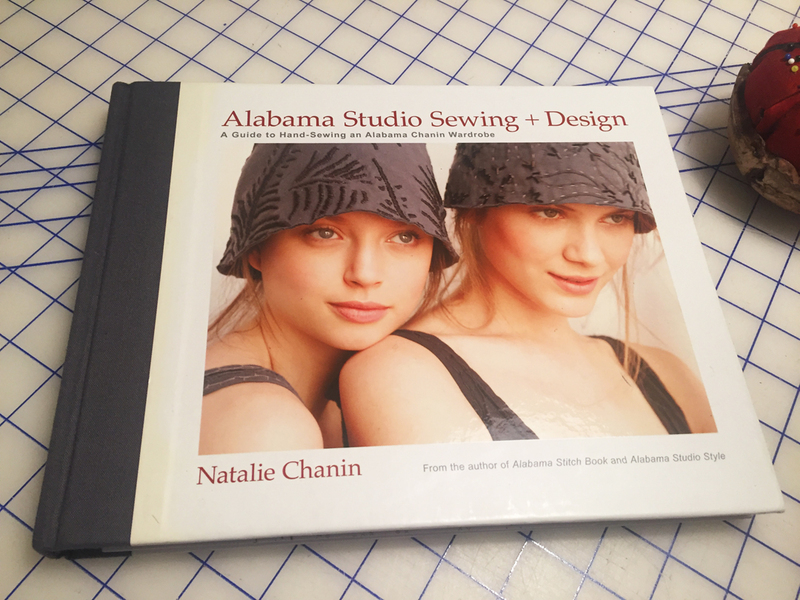 The Natalie Chanin book that I own is Alabama Studio Sewing + Design. I’ve looked at all of Natalie’s books and this one seemed the most useful for me. It covers all the basics of her trademark handsewn style applique and beading and includes patterns for a few piece of clothing. After studying the reverse applique technique intently, I was ready to paint and stitch! 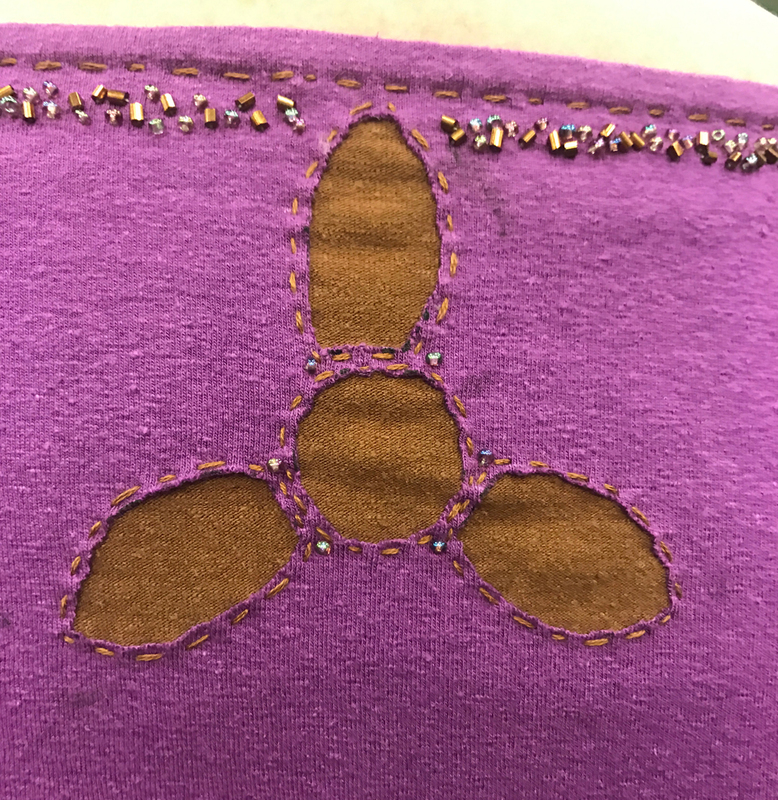 I love hand stitching. The quiet rhythm of the needle and thread, the gentle building of the stitches and having a project that will go anywhere with me are all quite appealing. In addition to all that, my mom taught me to embroider and it’s always like having a bit of her with me when I hand stitch. I like that! These are not colors I’ve ever seen in any of the Alabama Chanin makes and I eventually decided to trim away all of the black paint line I’d left. But, I loved them and thought they would work well for the Alabama style. I chose embroidery floss to coordinate with the backing color and I’m pleased with the look. 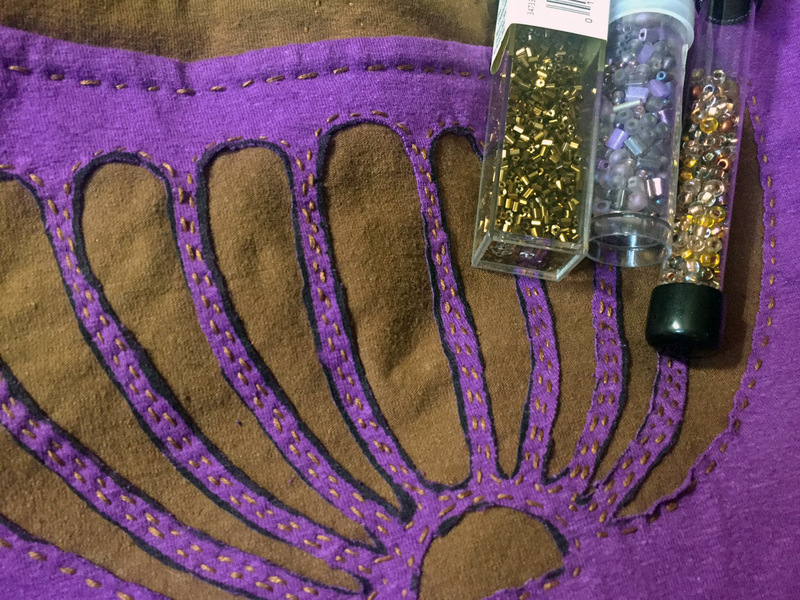 Over the years, after taking classes from Anita Luvera Mayer, I’ve learned to love hand beading, too. Anita hand sews everything. Seriously everything! And, it is again that quiet rhythm that makes hand beading a joy. 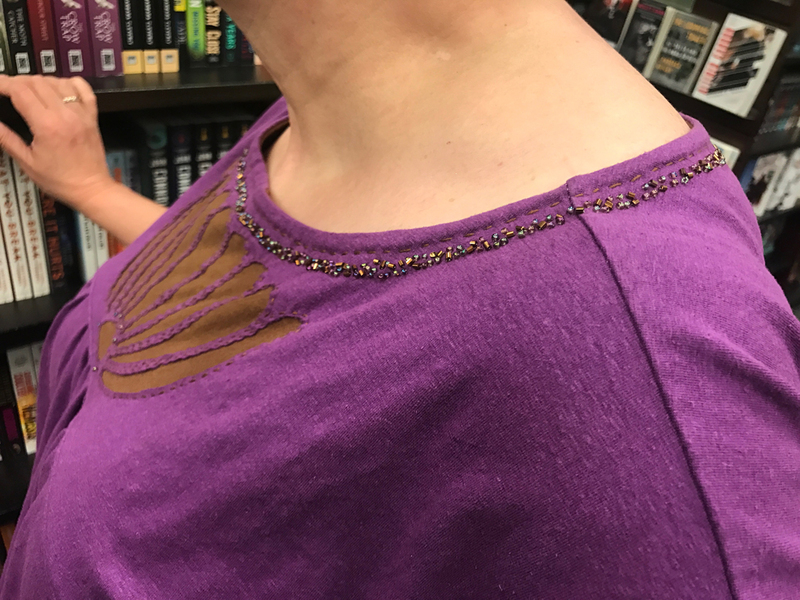 Beading around the neck in random colors and just a wee bit of beading near the applique finally seemed just right to me. I do love the neck encirclement, but the “wee bit” at the applique seems kind of skimpy to me now. So, I may add more at some point. 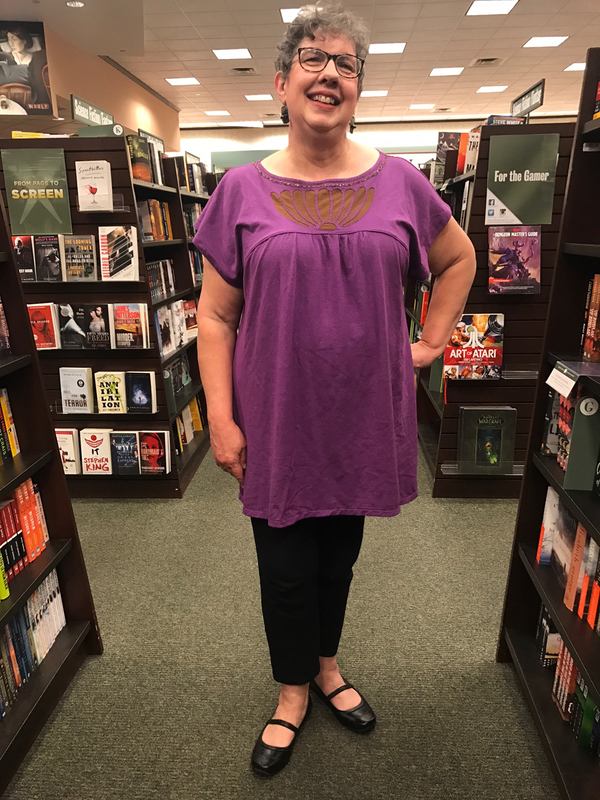 Indygo Junction’s Slight Sleeve Top is marvelous! It’s super easy and quick to put together and comfy to wear. That ticks all my boxes for a pattern and I’ll definitely use it again. If you can’t find the Slight Sleeve locally, click here. Enter the Giveaway!! Enter the Giveaway!! Teresa is offering a yummy box of Texture Fabric Hemp and Organic Cotton Scraps as a giveaway for us!! I’ve purchased these scraps before, they’re generous size strips and/or pieces – very inspiring and creatively useful. Great for kids clothes, purses, totes or . . . backing reverse applique. Hey, there’s a fab idea! As Teresa says, “At Texture Clothing, we are always striving ‘towards zero waste’. We make accessories from our scraps and we also sell them too!” To see what others make from these marvelous “scraps’, click here to visit the Texture Clothing Getting Scrappy! Facebook Group. You’ll love it!! This is one of the most satisfying projects I’ve made in a long time. There’s something quite magical about stepping away from the sewing machine and blissfully hand sewing for a while. We can all use a little more bliss and magic, right!?! To visit Texture Clothing, click here. To purchase Indygo Junction’s Slight Sleeve Top & Tunic, click here. To check out what Alabama Chanin is all about, click here. Thanks for dropping by! I hope you plan a little fabulous, stress-free hand sewing soon!! The Slight Sleeve Top pattern was provided to me by Indygo Junction and the Knit fabrics were provided to me by Texture Clothing, sponsor of the giveaway. This post includes affiliate links and I may receive a small payment if you make a purchase using that link. Thank you if you do – it helps to keep The Sewful Life stitching along and I sincerely appreciate your support. All opinions are solely and truly mine and I only gush about things I love! Hi Annette! I live in South King County (Enumclaw), were almost neighbors..LOL! Anway, in one of the facebook groups your clothing you make caught my eye and that’s how i started following you! I have been sewing for hummm, over 40 years, clothing for many years then took a break and got into quilt making, machine and hand applique. 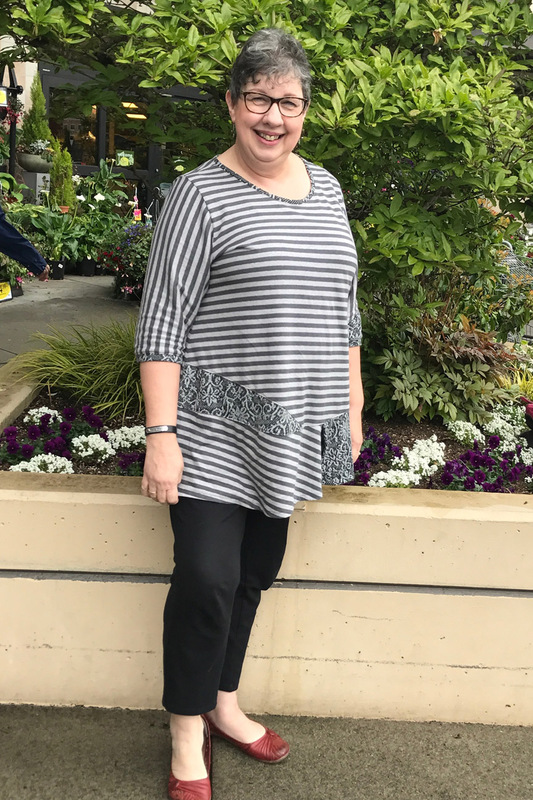 This past year i have started sewing clothing a little and then saw our shirts you have been making which has inspired me to get back into sewing my clothing again on a regular basis! I love your taste in patterns, so much so that i have ordered 3 of the patterns in the past 2 days. Indygo Junction has always been one of my favs! Thank you for sharing your wonderful skills, patterns and fabrics, i love them all! Hello Laurie! Thank you so much for your lovely comments!! Oh, my goodness – we’re like sewing sisters. How cool! You have made my day (probably my week!) and I’m thrilled that I have inspired you. I’ll watch for you to post on Facebook now – which group? You might look at the Indygo Junction Sewing Pattern Group on Facebook, too. I’m an admin there and it’s a good place for inspiration, too. Have a wonderful weekend!! Great choice of design for this embellishment. I made that top pattern last summer and did not like it. I made it with woven fabric. I found it was way too snug around my hips, so I added an upside down V panel to each side. And then I gave the pattern away. Looking at your top, I think the pattern is way better suited for knit fabric. Your top drapes beautifully! I LOVE hand stitching and will create any excuse to do some!! LOL! When my daughters request re-fashions of clothing I always suggest it for embellishment! LOL! I love your choice of fabric colors etc. I am not one for the muted or black fabrics. I can’t wait to get started!! Hi Eliz – Thank you so much for your kind comments!! I’m glad you’re enjoying reading about my sewing adventures. I’m sorry the pattern didn’t work out for you! Try measuring the pattern pieces and you to make sure you will “play well together”. That always makes such a difference for me. Yes, the knit was great and I think the design is best suited for lighter weight drapey fabrics. They always feel so nice, too! I’m glad to know another hand stitching addict!! It is such a wonderful art. 🙂 Do try the Alabama Chanin stitching. It was really fun and diving in with just a small amount like this really encouraged me to do more in the future. I’d love to see what you make! I haven’t ventured into reverse applique yet. Did you do anything specific to keep your tread twisting? I find that with hand sewing that tends to be an issue for me. I love what you did on this top! I think my favorite part is the detail on the back yoke. It is rather unexpected. Thanks, Delia!! Anita, who I mention in the post says there should always be something unexpected on the back, so it was fun to do that. Yes, crazy thread! I don’t do anything special, although I know some people who run their thread lightly along beeswax before stitching. I just let my thread drop once in a while to untwist and I don’t sew with a very long length. Anita, also taught me that and it makes stitching much less cumbersome. Use only about an 18 inch length and see if that helps. The time you lose in re-threading, you’ll make up in fewer knots and twists. Hope that helps!! Good Morning, Kathleen! Oh, I know about the sewing room overload syndrome. All too well!! I was on a freeze until one of my favorite stores decided to move far away and had an enormous sale. Sigh. . . But, you’re right, giveaways don’t count – hurray!!! It’s fun to read about this and see how this interesting technique is done. Thank you so much!! It was really a lot of fun to do! Hey, Kathleen – Thank you so very much for your nice comments!! I swoon over Natalie’s work, too and would love to brave a larger project sometime. We’ll see. I’d love to see your project! 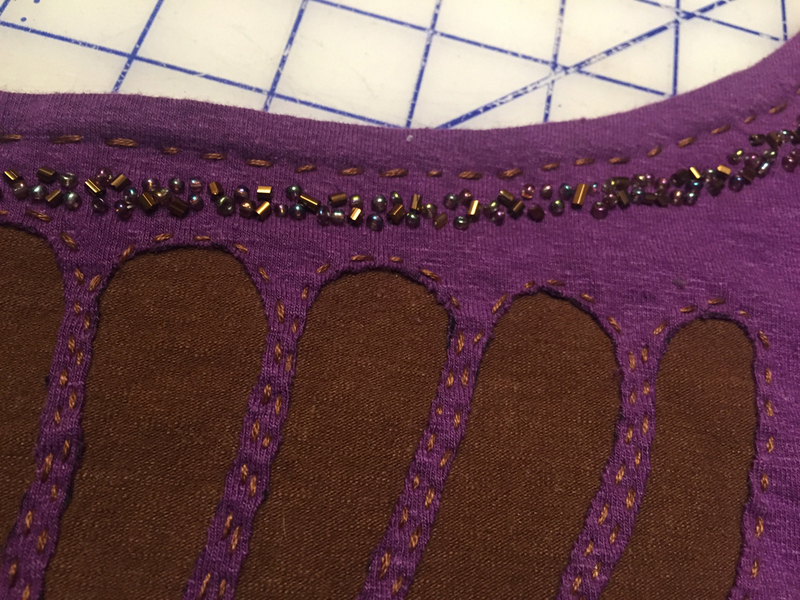 I did a lot of pinning to keep the fabric layers flat until I had them stitched together. I actually wound up trimming around the designs on the back when I was done, because it looked like the back layer wanted to ripple and that wasn’t very appealing. I don’t use a hoop when I embroider. I never have. Over the years I’ve embroidered, I’ve just learned to keep an even, relaxed tension on the fabric while I’m stitching. I can’t remember if a hoop is recommended in Natalie’s books, but I’m not sure how well it would work on a knit either. 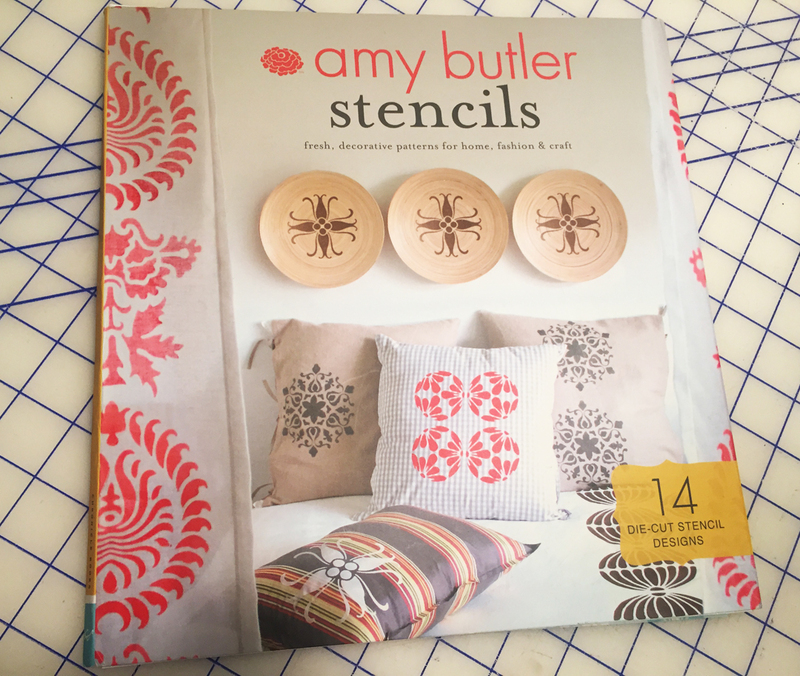 I’m amazed that you found that Amy Butler stencil book! I like to put links in my posts to make it easy, but I couldn’t find it in stock anywhere. It’s designed for Home Dec, but I’ve used bits and pieces of the designs successfully for garments. There’s a stenciled t-shirt in my MMM Re-Cap posts from last year you might enjoy seeing. https://sewfullife.com/2017/05/23/me-made-may-2017-week-three/ Pockets – yes!! Brilliant idea and maybe a jacket yoke or cuff, too. Let me know what you do! I enjoyed reading your blog post on the top you made. I’ve never heard of Texture Clothing so looked at their website. It’s always good to find new fabric sites. I’ve read a good bit about Alabama Chanin and her techniques the last few years. They sound like a lot of fun to do though I’m not sure I’d be comfortable wearing as much as is on her RTW garments. I like the amount you have on your top. I could handle that much. I found your blog through Rhonda’s Creative Life and have enjoyed reading some of your other posts as well. Hi Carolyn! It’s nice to meet you and thanks for the lovely comment. I thought I would try out just a little of the Alabama Chanin technique and see what I thought. This top worked out well and the Texture Clothing fabric is pretty amazing. (She posts new fabrics from time to time, so keep watching.) Thanks so much for hanging out with me!! This is beautiful. Looks very intricate. Thanks, Karleen!! It was pretty simple to do and the results are great fun! This is just gorgeous! I can’t decide what I like more the cutout with stitching or the beading around the neckline. The reverse appliqué embellishment on the Indygo Junction top is very creative and just lovely! Looks like a nice shirt pattern! Yes, I like it and will try it in a nice drapey woven sometime, too. This was my first time making the pattern and it was fun! I love reverse appliqué. Yours turned out beautifully. Thanks for the giveaway. Thanks so much, Kathy!! It was fun to finally try this and I’ll definitely do more. Hurray for Teresa’s generosity with the giveaway, too! I too enjoy hand work its great for travel, waiting and when I need to be still. The embroidery added just the right about of interest to your shirt. Thanks, Renee! Yes, those are all the things I love about handwork, too!! It’s very satisfying work and I love adding it to things I’ve sewn. I love reading your blog and find it very inspirational! I’m working on an Alabama Chanin style poncho and love the hand-sewing. Thank you so much, Cynthia!! I’m so glad to hear I’m hitting the sewing mark for you! Your poncho sounds wonderful and like lots of hand work fun. I’d love to see a picture when you’re done! Congratulations, Cynthia!!! You’re the winner of the Texture Clothing scrap box! 😊 Please send your mailing address to me at sewfullife at gmail dot com and we’ll get that box on it’s way to you. I know you’ll put it to good use!! This looks lovely! Such a nice result. Thank you!! It was such fun to do! So beautiful. Thanks for sharing Natalie’s work. I did not know anything about Alabama Chanin and today I watched the skirt video on free Craftsy, I love the soft appearance of the cotton and the slow stitching approach to this technique. What a treat her videos and your blog is. Thank you so much for the sweet comments! ❤ Excellent choice on the video!! I've purchased that one, just haven't finished it yet. I believe she has another one on Craftsy now, too. Such fun!! I am just getting ready to embellish a few of my sewing projects in Alabama chanin style. I love your beading and reverse appliqué! Thanks so much, Heidi!! Sounds like you’re having fun with Natalie’s techniques!